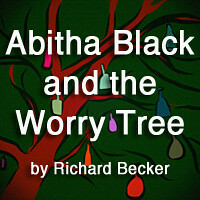 by Rich Becker: Finding Spin: Bob Conrad Cuts Through The Spin! Finding Spin: Bob Conrad Cuts Through The Spin! Misinformation is a conversation that frequently comes up in my public relations courses, with no single source of information exempt from bias, fabrication, and blatant slant. One could easily argue that it makes up the majority of the information we are exposed to every day and the trend — driven by popularity and shareability — is increasing exponentially, with the media being especially suspect. Where did all the objective reporting go anyway? In his book, Spin! How The News Media Misinform And Why Consumers Misunderstand, Bob Conrad captures some of the story, leaning more toward current events than the short history of objective journalism and why it is changing (regressing) today. And missing the history of it all is probably the greatest flaw in an otherwise well-presented thesis book. After all, one cannot fully discuss objective journalism without discussing Walter Lippman, who set the standard for it. Prior, journalism wasn't even considered a real profession. And why would it be? For all of the good people like Lippman were trying to do, other publishers like William Hearst and Joseph Pulitzer used sensationalized news to drive circulation much like media outlets do today. They did it enough so that both are readily linked to helping start the Spanish-American War. How ironic that 100 years later, with new media on the rise and mainstream trying to drive circulation, we find ourselves relearning the same circular lesson. Unless, of course, you look at it all differently. Although yellow journalism did not get its name until the turn of the late 1800s, it was alive and well in the United States, both preceding the American Revolution (to prime independence) and immediately following it (to mutually ridicule emerging political parties after the writing of the Constitution). But other than this omission, Spin! tells some of the modern story. Based on the assumption that journalists still pine away for objective journalism (they don't), Conrad captures several concerning stories in less than 90 pages. In the telling, he also catches more than one journalist tripping on his own logic. Conrad takes the logic to task because he rightfully points out that interpreting and shaping the information is how it becomes biased. And, in fact, it is worse than the front end suggests. Many journalists who put pen to paper in 1960s and 1970s discovered new styles for writing the news — with the aim to set agenda or sometimes entertain with one. From there, Conrad moves into other stories to demonstrate some of the real challenges that face journalism today: reporter bias, anointed elitism, and defensive posturing. Most of them fall into one of the six divisions of modern media, but a few go further in describing a blatant disregard for the truth, something a few journalists have used to gain attention and awards (e.g., those who make it up). All of it makes for good reading. And yet, if the real measure of Conrad's book can be found in solutions, then it doesn't seem promising for us in this brave new world of media manipulation from outside and within. His seven solutions, some new and some old, include: creating space for more citizen journalism, reestablishing the barriers between news and opinion, adopting principles from public relations, holding journalists accountable, and raising the bar in expert selection. Will any of these solutions work to curb misinformation? Not one of them is necessarily a bad idea and all of them can be starting points for consideration. But unfortunately, none of them can reach the ultimate goal. They cannot bring back objective journalism. If we really want credible and objective news, then citizens have to support it while learning to suppress their growing appetite for affirmation news. And right now, feeling freed of inconvenient facts that run contrary to their own individual ideologies, it's virtually impossible for a major media outlet to survive and maintain objectivism. If I had to guess, I would say that today's media needs a wide-reaching and catastrophic miss that results in massive public outcry. And if we are to avoid such a costly blunder, then we need an emerging voice within journalism like Lippman in his era. Ergo, someone needs to shame the media into making the truth their ultimate goal once again. And if someone doesn't soon, then it will take something bigger than any of the examples cited in Conrad's book, which is a frightening thought. I used to think, much like Conrad, that a collective voice might emerge from the ranks of citizen journalists to get the job done. But I don't see this happening anytime soon. As long as popularity and perceived influence are more cherished than the truth, then we will continue to be buffeted back and forth by polarized opinion, popularizing misinformation, and selective facts. Where Spin! wins despite some shortcomings in research. While it might not sound like it at times, I would recommend Spin! to anyone hoping to gain a better grasp of where the media are today. Not only does Spin! 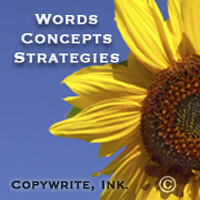 make a great catch-up primer and indispensable resource, it also sets an agenda for a conversation that needs to happen. Given you can consume it all in a few hours (and then spend weeks chasing down conclusions), all the better. However, that doesn't mean you can afford to dismiss your own due diligence after reading it. Conrad brings in much of his arguments from what he is exposed to, which sometimes skews his own perspective. While he disclaims some of this in the preface, it's still bothersome to see someone attributed as if they coined "he said/she said" journalism when they didn't, the omission of a historical context, and his own personal bias (which I have to point out despite agreeing with much of it). In other words, it's a must-read book for anyone with an interest in media and citizen journalism, but only as a primer for a much bigger pool of knowledge that is out there and waiting to be assembled. Still, I will recommending it to my class. I regularly recommend his blog for good reading too. I received a complimentary copy of Spin! 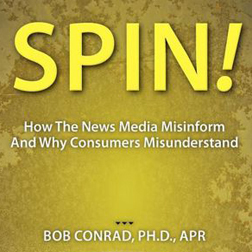 How The News Media Misinform And Why Consumers Misunderstand by Bob Conrad with the understanding that the book would be reviewed.